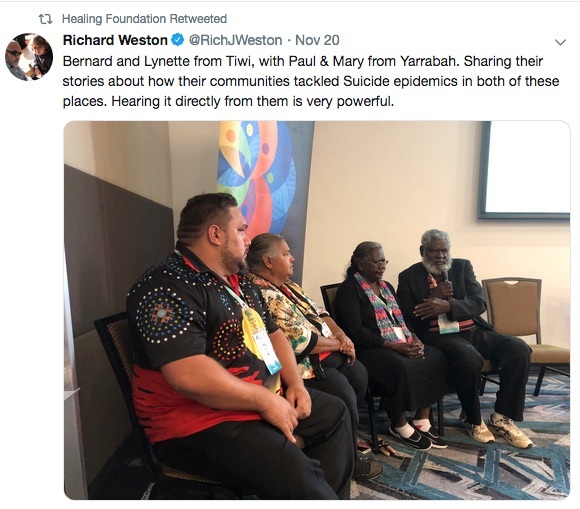 Inspiring stories of how two Indigenous communities dramatically reduced high levels of suicide among their people through community led and owned solutions were shared at the second National Aboriginal and Torres Strait Islander Suicide Prevention Conference in Perth. 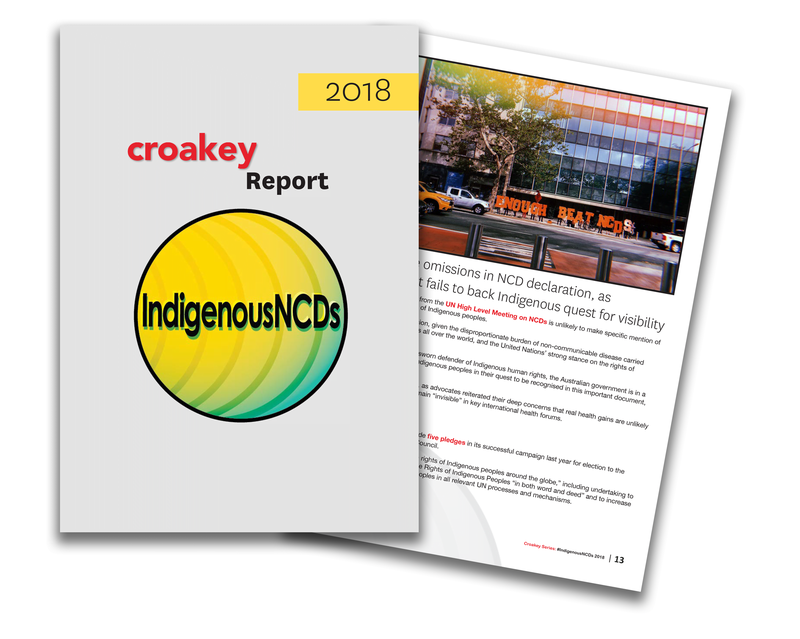 The responses of the two remote communities – the Tiwi Islands, north of Darwin, and the Queensland rural community of Yarrabah, west of Cairns ­– are also detailed in a new report, Stories from community: how suicide rates fell in two Indigenous communities, which was launched at the conference by the Healing Foundation. There’s a mural on the wall at the Gurriny Yealamucka Health Aboriginal Corporation in the community of Yarrabah, about 60 kilometres from Cairns in northern Queensland. 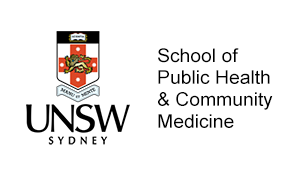 It acknowledges the day in 1995 when the community declared a “stop work” day and more than 400 community members, many scared by the wave of suicides amongst them, came together for what is now remembered as the community suicide crisis meeting. 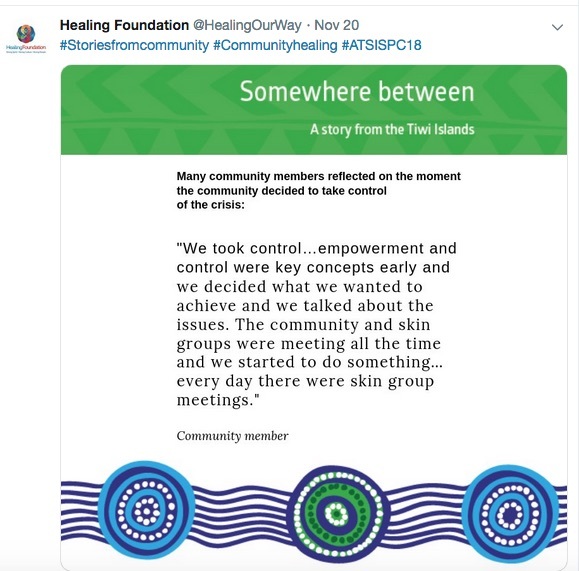 Such was its importance that even young people who weren’t alive at the time can tell the story of what happened and how it was a major turning point in the community’s history, according to a new report from the Healing Foundation. 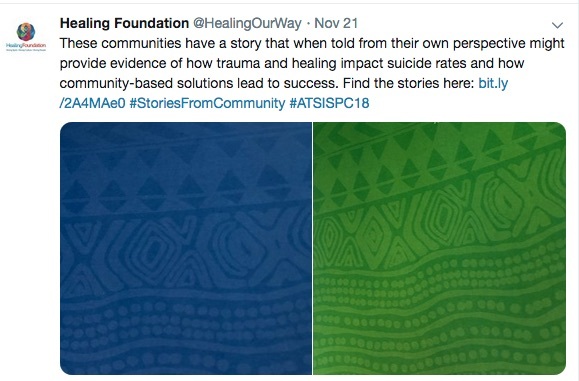 Stories from community: how suicide rates fell in two Indigenous communities, launched at the second National Aboriginal and Torres Strait Islander Suicide Prevention Conference, tells how Yarrabah and the Tiwi Islands community, north of Darwin, each took control of a suicide crisis in their midst. In Perth for the launch, Aunty Mary Kyle, a social and emotional wellbeing (SEWB) worker in Yarrabah, recalled how non-Indigenous psychiatrist Professor Ernest Hunter had come along to the meeting to help. 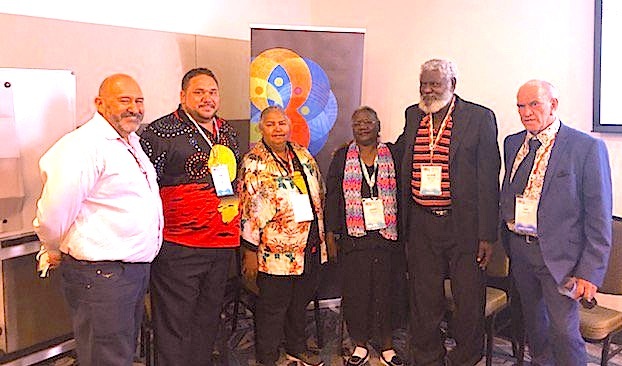 “A lot of people come into our communities and tell us what to do, but they don’t know how spiritual we are, they don’t know who we are, they don’t know what we like,” she told the conference. 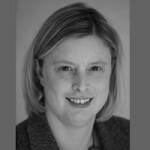 “What he said, and it really stuck with me, was ‘I’m not coming here to tell you what to do, you have all the resources and all the people to know what to do’. 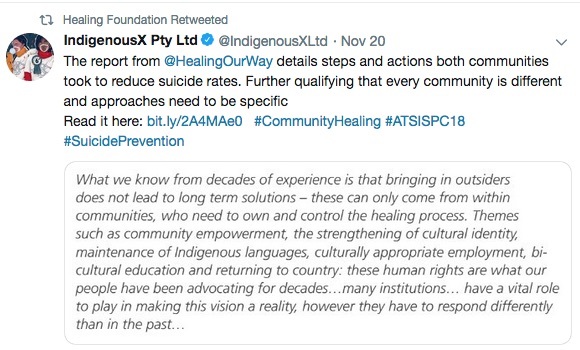 According to the report, the first suicide anyone encountered on the Tiwi Islands was in 1989, at a time when there was no word for it in Tiwi language. By 2006, the community, just a 20-minute flight from Darwin, had one of the world’s highest suicide rates, and was attracting headlines like “The Land of the Dead” that shamed the community. The wave of suicides that triggered a community response began in June 2005, and within weeks had sparked more than 50 copycat attempts. 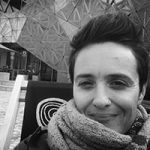 Six of the suicides were Sistergirls (a term used by Aboriginal and Torres Strait Islander people to describe gender diverse people with a female spirit) who struggled for acceptance within families and communities. 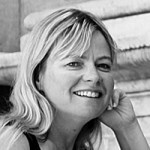 The report sketches the political and service environment at the time: multiple but fractured local services and the loss of community control that had come through aggressive government policies such as the NT Intervention, as well as traumatic loss of connection to culture through ongoing colonisation. At Yarrabah, the community had faced three waves of suicide in the 1980s and 1990s. 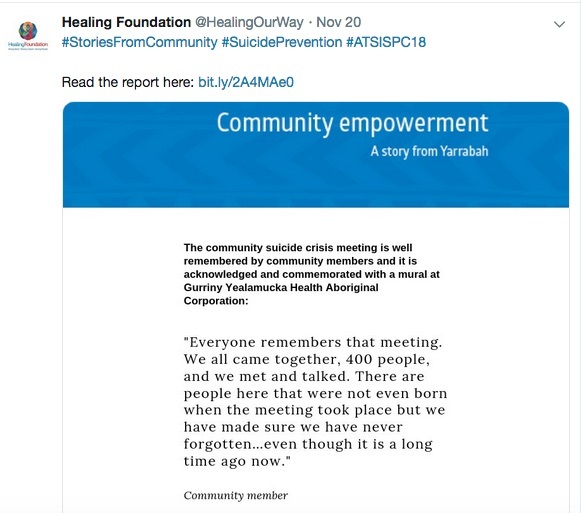 One community member described in the report how the third wave in 1995 sparked around 95 suicide attempts in the small rural community. “We didn’t know what was happening and it was too much to take in,” said one worker. 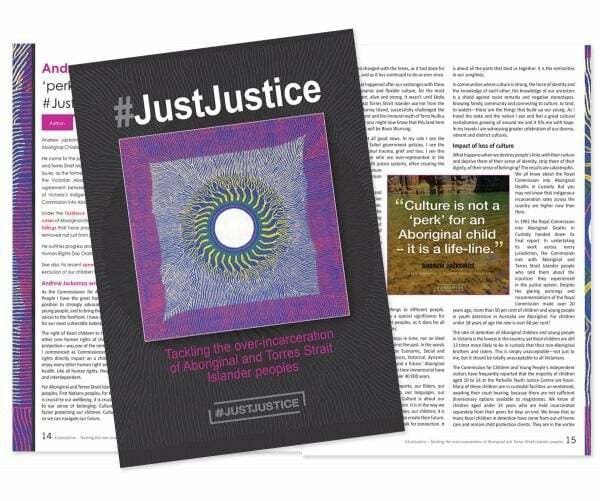 For Paul Neal, who works with young people in Yarrabah and also attended the launch in Perth, the problems for his people had begun with colonisation and were entrenched by a century of loss of identity, family and culture. The community was made up of around 4,000 people – 80 per cent identify with the Stolen Generations, he said. “You were basically owned like cattle,” he said. But the sheer scale of the suicide crisis in 1995, while frightening, galvanised the community. “It impacted the whole community and became a community issue so we knew we had to come together as a community and we tried to work together as a community. 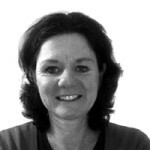 See the problem our way and address the problem our way,” one health worker said in the report. 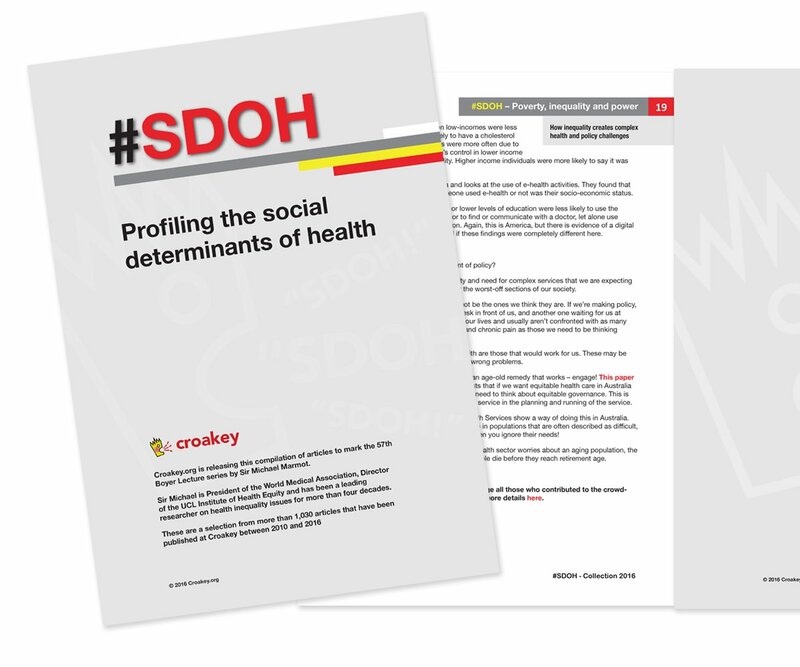 On the Tiwi Islands, the recognition of a strong role for the four skin groups is identified as a critical factor in the dramatic reduction in suicides that was to come. Tiwi Elder Uncle Bernard Tipiloura has been involved since the beginning, and he and his wife still go every Tuesday to the local school to teach culture and songs and dance. “We want to see them be proud of their own dances, their own songs,” he said. In Yarrabah, the community took a different approach, through control of health and wellbeing service provision. 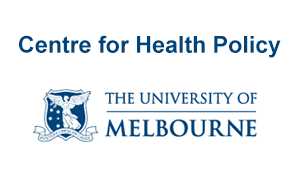 A new community controlled primary health care service model was established, the first of its kind in Queensland, along with a family wellbeing project, a men’s group, and the employment of dedicated health workers – known as Family Life Promotion officers rather than Suicide Prevention officers. 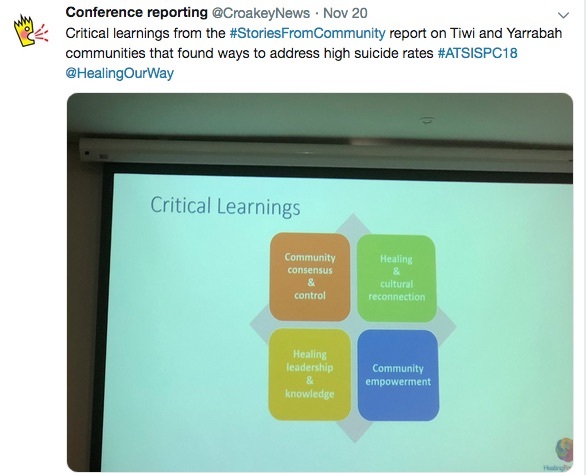 These responses remain the “cornerstones” of Yarrabah’s turnaround and “all remain key strategies that guide the community as they maintain vigilance and build education and awareness around suicide prevention and intervention”, the report said. 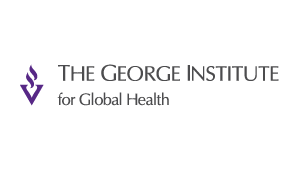 The authors warn that the problem of suicide is not solved once and for all, of course. 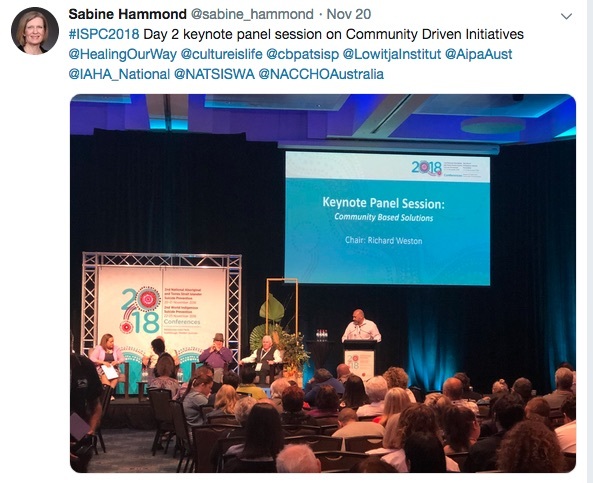 In fact, their consultations had to be suspended for a short time in 2017 when the Yarrabah community faced a significant challenge around suicide ideation and a number of deaths by suicide. 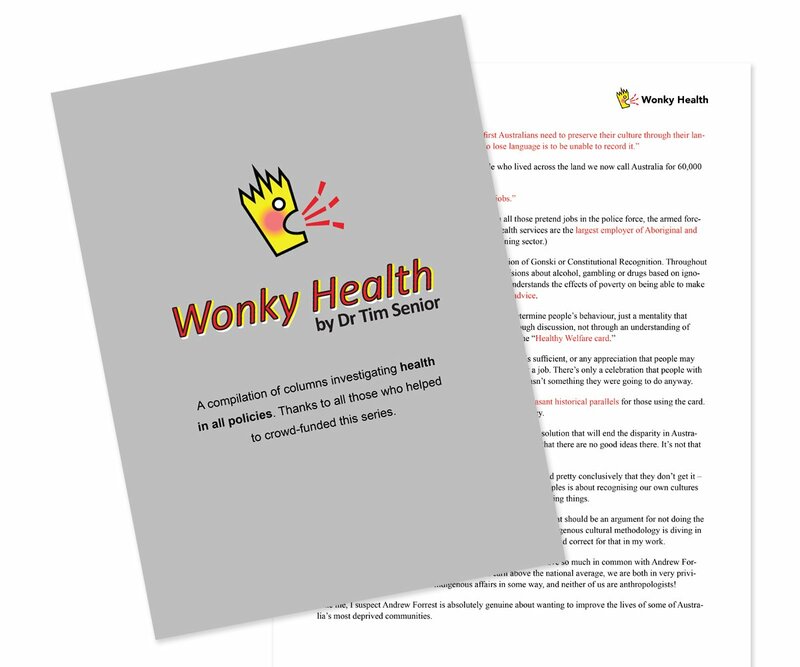 However, although data is difficult to collect, author Dr John Prince says the communities have gone from having some of the highest rates in the world to where “suicide is now rarely seen, although it’s important to say it hasn’t disappeared”. As importantly, he said, they now have their own cultural response and framework for prevention, intervention, and response. 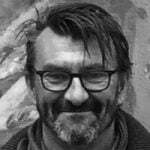 solutions need to come from the ground up and services need to fit through the cultural frameworks and not the other way round. supporting families and engaging families with strong women and strong men. “The Tiwi and Yarrabah stories show us that when we empower ourselves to tackle challenges we are stronger. Our communities leading our solutions can make a difference. At the launch, Weston said the suicide rates in both communities, like elsewhere across Australia, were long-term outcomes of the colonial process, and the traumatic disruption to culture and families that continues today, as well as a broader context of deep poverty and social and political exclusion from many decades of brutal government policies. But these community based solutions to the suicide crises have created “a new narrative” for both communities, he said. 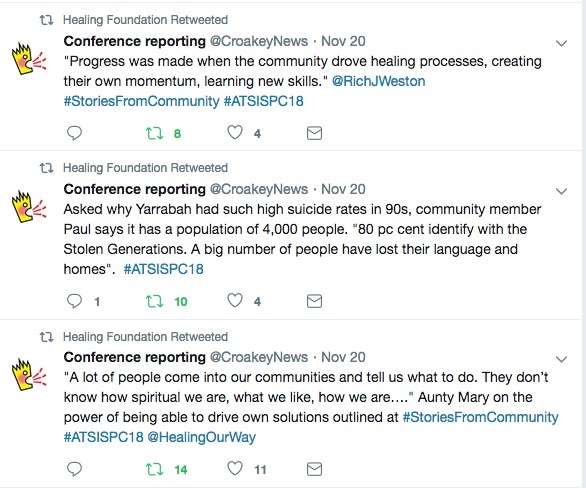 Weston was struck by how community representatives had spoken about the strengths of family and love in their solutions. 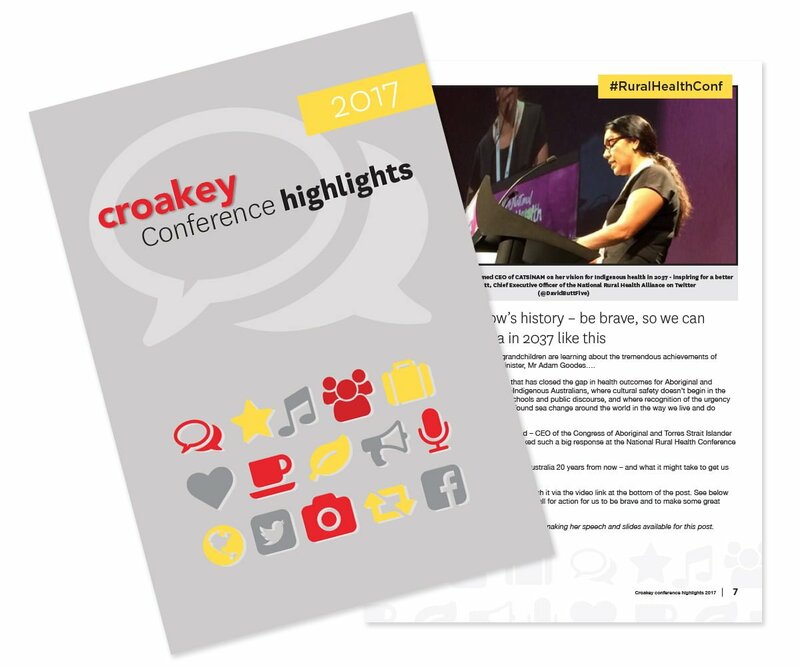 • Summer May Finlay and Marie McInerney are reporting for the Croakey Conference News Service. 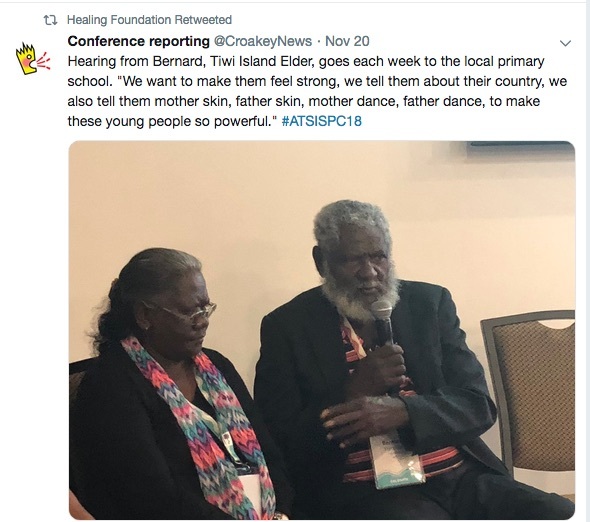 Bookmark this link to follow the coverage of #ATSISPC18.